(Rwanda 1980 Apollo 11 Moon Landing - 10th Anniversary - Mint Never Hinged (MNH). Set of 6 values (6v Set): 50c, 1.50F, 8F, 30F, 50F, 60F. You will be back for more! 3) Select each item and 'Add to Basket'. :- The item you receive may not be the item scanned, but will be of similar quality. Date of issue: 08 December 1964. No Exclusions. Condition: Mint Never Hinged. No Exclusions. Condition: Mint Never Hinged. SG 159-67 2 x SETS MNH 2 V LMM OF SPORT & BUILDINGS - ALL VERY FINE. 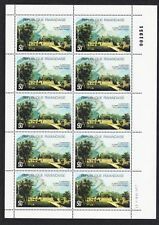 THREE PART SETS WITH DUPLICATION ALL MINT NEVER HINGED. You think price is not right?. -:- The item you receive may not be the item scanned, but will be of similar quality. No Exclusions. Condition: Mint Never Hinged. Date of issue: 12 September 1973. Set of 8 values (8v Set): 20c, 30c, 50c, 1F, 3F, 5F, 10F, 80F. You will be back for more! (Rwanda 1979 Butterflies - Mint Never Hinged (MNH). Set of 8 values (8v Set): 20c, 30c, 50c, 4F, 15F, 30F, 50F, 150F. You will be back for more! 3) Select each item and 'Add to Basket'. 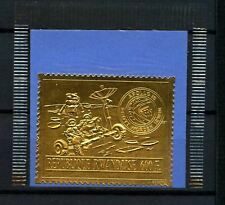 (Rwanda 1970 Moon Missions - Mint Never Hinged (MNH). Set of 8 values (8v Set): 20c, 30c, 50c, 1F, 3F, 5F, 10F, 80F. You will be back for more! 3) Select each item and 'Add to Basket'. (Set of 8 values (8v Set): 20c, 30c, 50c, 4F, 5F, 15F, 50F, 75F. You will be back for more! 3) Select each item and 'Add to Basket'. ((50c) - Goliath Herons. (20c) - Eastern White Pelicans. 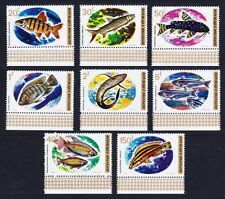 Rwanda 1975 Aquatic Birds - Mint Never Hinged (MNH). Set of 8 values (8v Set) You will be back for more! 3) Select each item and 'Add to Basket'. 1981 Norman Rockwell Illustrations sheet set. (Set of 8 values: 20c, 30c, 50c, 1F, 4F, 10F, 34F, 100F. You will be back for more! 3) Select each item and 'Add to Basket'. ((10F) - Zorilla. (20c) - Serval. Rwanda 1981 Carnivorous Animals - Mint Never Hinged (MNH). (30c) - Black-backed Jackal. Set of 8 values (8v Set) (100F) - Hunting Dog. You will be back for more! 3) Select each item and 'Add to Basket'. (Set of 10 values (10v Set): 10c, 20c, 30c, 40c, 1F, 3F, 5F, 10F, 40F, 100F. Rwanda 1966 Flowers - Mint Never Hinged (MNH). You will be back for more! 3) Select each item and 'Add to Basket'. :- The item you receive may not be the item scanned, but will be of similar quality. No Exclusions. Condition: Mint Never Hinged. Date of issue: 20 March 1972. Akagera National Park. :- The item you receive may not be the item scanned, but will be of similar quality. No Exclusions. Condition: Mint Never Hinged.